Donuts HAPPEN. You find yourself on the go, and donuts are there. You make a coffee run, and donuts are there. You walk into the break room, and donuts are there. "Oh well, I'll just have one. How bad could it be?" 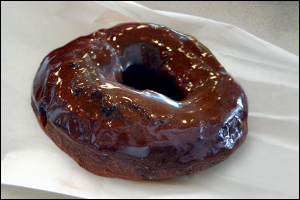 We're dealing with rings of fried dough glazed in sugar -- the nutritional info ain't pretty. But we recently created a swap so amazing, we can barely believe it ourselves. All you need is a donut pan (find 'em online and at places like Bed Bath & Beyond) and the HG recipe to the left. 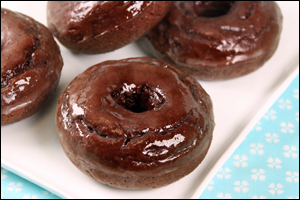 Being able to whip up glazed chocolate donuts without cuckoo fat counts is almost like magic. And if donuts are gonna happen, we prefer them to be of the magical low-fat variety, thankyouverymuch. Let your buddies know it's time to make the donuts! Click "Send to a Friend" now.